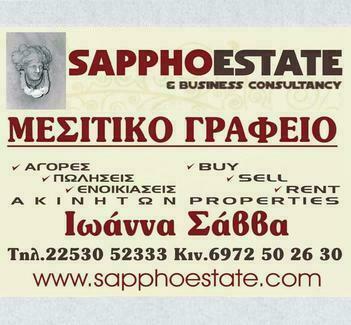 Well, this is a rare beast in these parts; A two bedroomed, recently renovated apartment in the heart of Skala Eressos. It's been completed to a very high standard and would make a fantastic holiday apartment, the rental opportunity is high. Situated down a quiet road, the apartment is literally a 2-3 minute walk from the beach and from the thriving resort of Skala Eressos with all of its many colorful shops, cafes, bars, tavernas and much, much more. There's really nothing to do here other than open a bottle of wine, sit back and relax! A beautiful courtyard with original cast-iron gate leads to the open plan. KITCHEN DINNER: Throughout this renovation project, high quality tiles feature. The kitchen diner is no exception. Though the high point is undoubtedly the huge, glass sliding doors which when fully open create a large area integrating both the courtyard and kitchen/diner. It has a very stylish feel to it. New kitchen units, sink and high quality splash back tiles give the whole place a contemporary feel. There'll be ample room for a dining table and chairs. BEDROOMS: There are two good sized bedrooms, one with a double, the second has 2 singles. Both have fitted wardrobes. Both utilise the original doors which is a nice touch. The lighting throughout has been well thought as is so in the bedrooms. It's more than possible to use one of the rooms as a living space/study area. BATHROOM ONE: It's huge, enough room to party! Large, metal effect tiles, new, stylish fittings and well thought out lighting give it a chic feel. BATHROOM TWO: A smaller affair but still to a very high standard including new fittings. WC, sink, shower. COUNTRY YARD: This is a peaceful and pretty spot. Raised beds with new planting offer the greenery though this is a very low maintenance space. It's a lovely color scheme and to the floor are magnificent slate tiles, again giving a really contemporary vibe. There's an outdoor shower too! Further tap for watering your plants. Adjacent is a closed, dry storage area, large enough for your kayak plus much more!